Whatever your reason for buying a used ice machine, there are a number of points to consider to make sure that you are making the right decision. Making a mistake can prove to be very costly. This does not mean that you should only look to purchase a new ice machine; you just need to be aware of the pitfalls, and understand that there is a cost-effective difference between buying a new ice machine vs a used ice machine or a refurbished one. For most users, an ice machine appears as a simple device such as an extension of the ice compartment of their refrigerator/freezer. However, due to the advancements that have been made in cooling and refrigeration technology the inner workings of ice machines are far more complex than one may realize. This technology is typically only understood by individuals trained on this equipment. This is where the underlying risks of buying a used ice maker are greater than if purchasing a refurbished model. Any of the components of a used ice machine may not be working and be in need of repair or maintenance. This repair cost can easily exceed the price difference of a refurbished machine or even a new machine when you factor in ice machine parts and labor. The best solution when buying a used ice machine is to pay a little more and go for a refurbished model. Refurbished machines are usually priced less than 50% off a new machine and give the purchaser great value and piece of mind. Every piece of equipment has to undergos rigorous testing before being offered for sale, which includes inspection, repairs, cleaning, sanitization and final testing before finally being labeled as refurbished. Many recognized brands are available as refurbished including Scotsman, Manitowoc, Hoshizaki, Bluestone, Norpole and Ice-O-Matic. 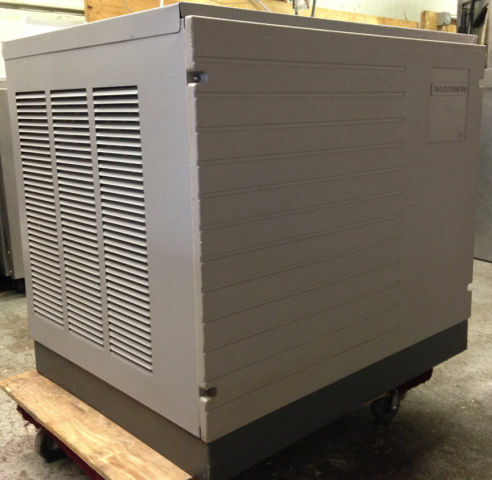 You will always find used ice machines for sale through classified adverts and online, i.e. Ebay these machines are sold without any type of warranty. When buying a machine “as is” you run the risk of also spending money on repairs and parts. Refurbished machines have been qualified by technical experts and offered with warranty regardless of the actual age of the ice machine. By looking to purchase a refurbished model or one that is classified as clearance, overstock, floor model or even scratch and dent you will be realizing significant savings in comparison to a new machine and many times a used machine as well. When buying refurbished, you are in fact purchasing a machine that is used, but will work just as well as a new machine offering the best value for your purchasing dollars.